Horseradish (Armoracia rusticana): growing, planting, caring. A condiment plant cultivated from ancient Egypt. Mixed with vinegar the root of horseradish easily replaces the mustard. 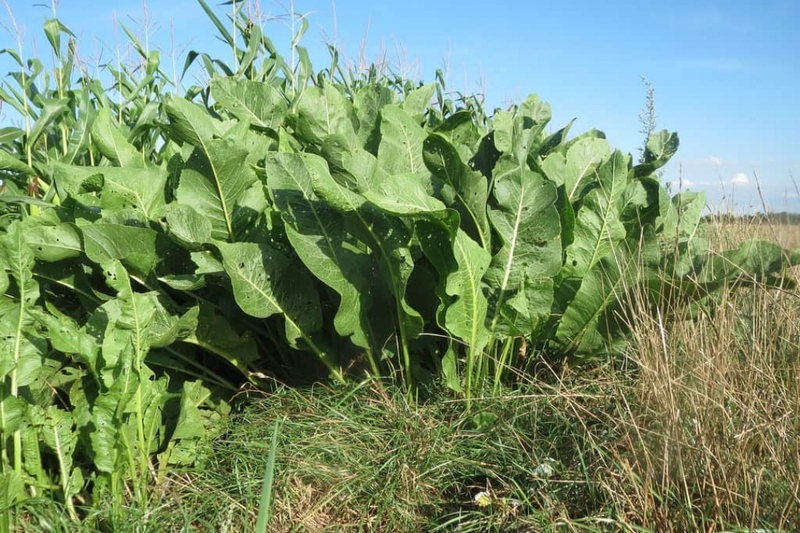 Horseradish is a perennial plant of the Brassicaceae family, with its large lanceolate leaves about forty centimeters that form a large tuft 60 cm high by 90 centimeters wide. The part usually consumed is the root, which can measure up to 50 cm in length. Be careful when handling it, because like hot peppers it is better to avoid getting into the eyes and other sensitive areas! A little advice : some parasites of fruit trees hate the smell of horseradish, so place it nearby. Avoid installing it in the vegetable garden, as it is a very vigorous plant. Plant horseradish between September and November or March-April in well-drained, cool, sun-soaked soil. Be careful, in warm regions it will prefer the semi-shade. Plan a large spacing with its neighbors because it tends to widen at the base, and once installed you will not be able to move it. Make a hole twice as large as the root ball, replace some of the bottom soil and place your horseradish. The root-stem limit must reach the ground level. Then replace the soil around the roots by tamping regularly. Form aearthbowl around the plant to water it the first months. Water well after planting, then mulch the base because horseradish likes freshness. Water especially the first month and possibly the summer in case of drought the first year. Then your horseradish has to fend for itself. To simplify the harvest and give it a better look, mulch around your horseradish on a few centimeters. This way it will have the moisture that suits it, and its is better looking. Do you want more? Horseradish is multiplied by division, so in autumn or spring, take either intact roots with a pichfork, or "splinters" of roots that have a leaf bud. Horseradish is harvested between autumn and spring. Then, its "roots" use their reserves to form the leaves. Wait at least 8 months between planting and first harvest. Using a pitchfork harvest the roots around the tuft depending of your needs. Then peel them, grated them and mix them with vinegar for preservation.